Often when I am out I try to do a bit of math while riding my noble iron horse known as that old bicycle. The disadvantage of doing math on your bike is that one the one hand you cannot go very towards complicated stuff where you need pencil and paper but on the other hand you can get deep by getting some good idea’s. And only when you get home and you have access to pencil & paper you can check if the stuff can be written out and see how your idea’s survive in the battle for attention from your brain. 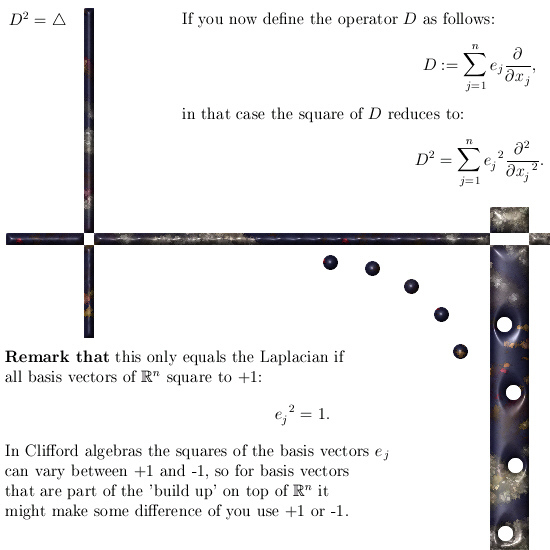 But a few times it crossed my mind to do that mind boggling factorization of the Laplacian once more; if I would make a top 10 or top 25 list of the most strange results found this factorization of the Laplacian would end very high. Yet when I check my own website, all that has to be said was already said about one year ago; on 05 August 2016 I posted the next seven pictures long post upon the factorization of the Laplacian using so called Wirtinger derivatives. 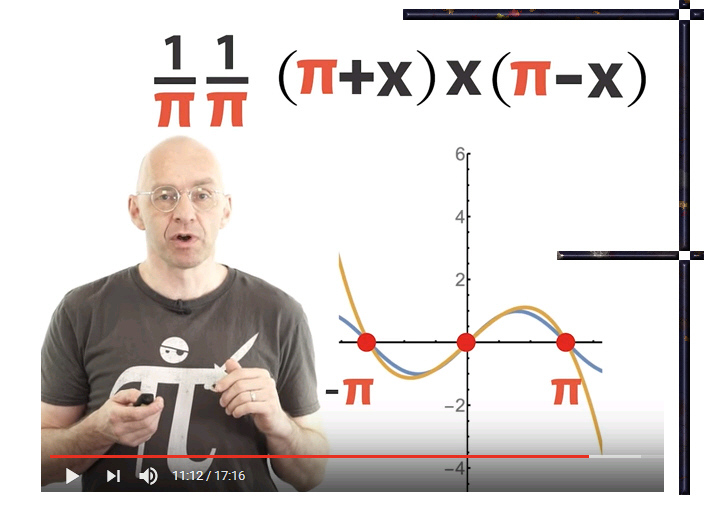 In another development I came across the latest video from the Mathologer, it is very interesting because he claims that the famous Euler identity is not from Euler at all. But Mr. Mathologer comes up with what is one of the famous Euler stuff, anyway a long long time ago it was one of the details that made Euler famous was finding what the sum of squared reciprocals was: 1/1^2 + 1/2^2 + 1/3^2 + …. Over 25 years back I did the same calculations as the Mathologer invites you to so let me share the video with you. At first it looks a bit difficult but all you need to do is think about how to write out those infinite products as sums and after that you apply the age old trick of equalling the left and right side of the equation. May be in a future post we will be diving a bit deeper into this because Mr. Mathologer has nice news upon who found what but he skips all that stuff like how to write the entire functions from the complex plane as (infinite) products. Ok, may be in a next post I will be diving a bit deeper in all those kinds of infinite products. Or may be it will be something completely different, anyway till updates. By sheer accident while I was only watching a video about why there is such a break between higher math and higher physics, I came across some weird stuff from a guy named Edward Witten. And the talk was about so called Seiberg-Witten monopoles, so my interest was aroused because I cannot allow plagiarism of course. Anyway it turns out that Mr. Witten and his Seiberg pal talk about massless monopoles without laughing. The concept of a massless monopole is so idiot that normal people with just a tiny bit of self respect would never talk about that. 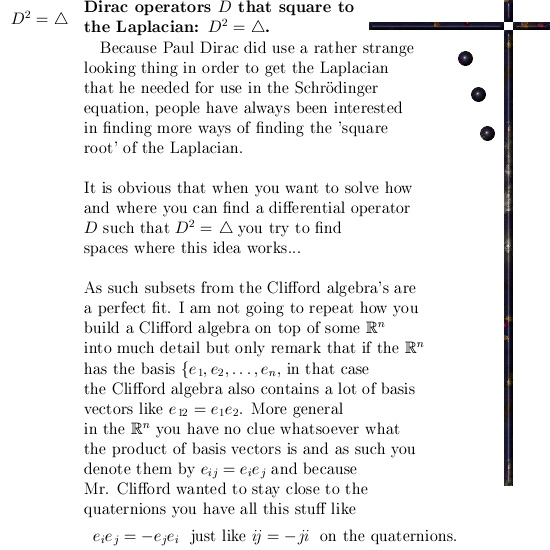 But the Witten guy wrote about Dirac operators and once more my interest was aroused and I looked it up: Dirac operators are differential operators D and if you square them you get the Laplacian…..
Basically when you try to find operators D that square to the Laplacian it is more like ‘operator problem looking for a fitting math space’ while in my above factorization of the Laplacian it is a math space (3D complex and circular numbers) that want a factorization. In the wiki you also observe in example number 4 that Clifford algebras are named a possible candidates, that is true but a few remarks are at their place. Let’s leave it with that, till updates my dear reader. More on the failure of IBM’s racetrack memory. Just over one week ago I posted reason number 48 as why electrons cannot be magnetic dipoles over on the other website, it is about the failure of IBM in crafting a new kind of fast memory. They failed because they treat electron spin like it is a vector while it makes much more sense that electron spin is one of two possible magnetic charges. Reason 48: The failure of IBM’s racetrack memory. It took me relatively long to find where the stuff all went wrong, at first I spend over a week every evening trying to find some stuff on the preprint archive and although there are some explanations found over there, because the writers of those articles are professional physics people they do not understand electron spin. Back in the year 2004 IBM patented so called racetrack memory; the goal was to leave the 2D structure we have in present day computer hardware and use nano wires to go 3D and as such exploit three dimensional architecture of future computer hardware. The racetrack memory is made from nano wires, those nano wires contain lots of magnetic domains but contrary to the magnetic domains you find in, for example, iron these domains contain only one spin state. According to IBM researchers all spin states are in the direction of the nano wire (from that you can understand they think electron spin is a vector, the vector represents the magnetic bipolar nature of the electrons according to IBM researchers). In the next picture you see a boatload of information; the red and blue colour represents of course the two magnetic spin states of the electron. As you see on inspection they can inject blue electrons from the left and red electrons from the right. And IBM thought they could transport those fragile things at high speeds, if true they would earn not billions but trillions over the long run of a patent. Here you see why it is important to keep an open mind on electrons spin because if you follow the standard model companies like IBM cannot make technical progress. 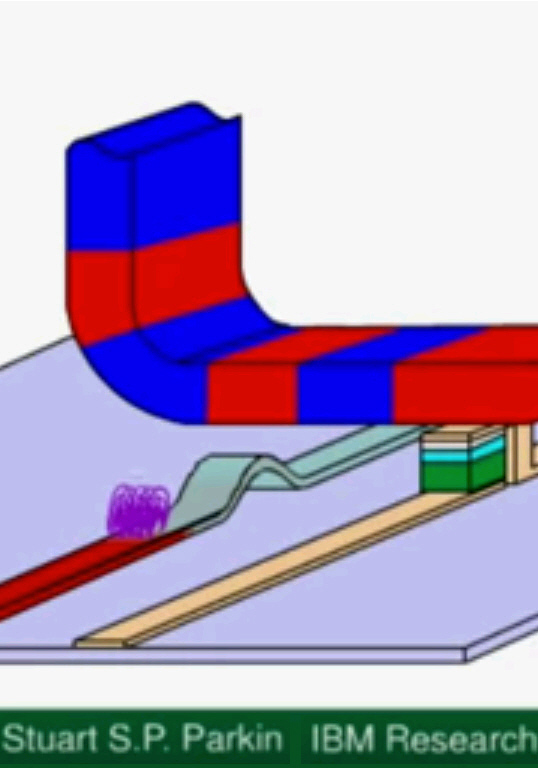 In the next picture you see how IBM visualizes how a small red region from the nano wire turns into blue: IT IS THAT WRITING WIRE BELOW WITH RED ELECTRONS IN IT!!!!! 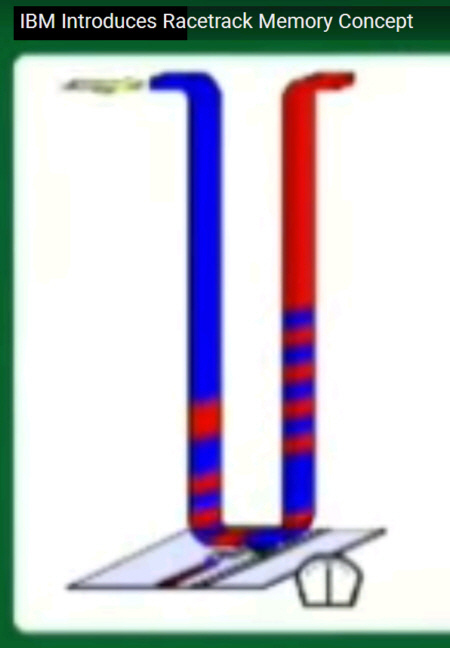 If electrons carry one of two magnetic charges and we use the principle that like charges repel, the red electrons on the writing wire repel the red electrons in the nano wire into the blue neighbouring blue domains. At the same time blue electrons will flow to the red region. So if my view on electron spin is true, in that case the simple act of writing information to such nano wires destroys the information in the surrounding magnetic domains. And that my dear reader is something that the professional physics people still do not want to acknowledge until this present day of 03 August 2017. By the way, next winter it is about the fourth or even the fifth year I am explaining as why electrons cannot be magnetic dipoles. Those people, the so called ‘professionals’ will keep on hanging to their silly beliefs around electron spin for a much longer time.